I love it when my co-tasters’ reactions are that immediate and direct. Especially when they’re my sentiments exactly. With a dramatic, almost dark-magenta color and pink edges, the nose on this baby was molasses, raspberry, gourmet mushrooms, and that wonderful smell of new-house construction. (Some might call it “graphite” or “pencil shavings.”) The delicious wine was full of boysenberry, raspberry-bar, blackberries, cherry pie, pipe tobacco, and cigar box flavors. Velvety, very smooth, and mouth-filling, the wine’s only tipoff to the significant alcohol content was the warmth in the finish all the way down to my heart. It reminded me of the Rosenblum we tried recently (see http://www.thefrugalwinesnob.com/?p=780), with a little less vanilla and a little more of an edge. Beautiful music indeed! This is an up-and-coming artisan winemaker off to a great start, and he’s obviously having fun with the project. LABEL NOTES: Bursting with ripe blackberries, dark cherries and an ultra-creamy texture, we once again thank our friend Ray Zanine for the unbelievable grapes he grew to make this wine. Enjoy with friends, or—by yourself! 1800 cases produced. TO PURCHASE: “The SRP is $18.99. Sold by the case direct from the winery. Only to states that allow inbound shipping. We ship thru www.AmadorWineShipping.com. Customer pays wine shipping direct to them.” The Frugal Wine Snob’s suggestion: If you’re reluctant to spring for a case, ask your local wine shop to obtain a case or two, try a bottle, and then buy the rest. 🙂 Seriously, though, the best way to try wine is at a tasting, and the next-best way is to purchase just one bottle (at first) based on a friend’s recommendation or the recommendation of someone you trust. 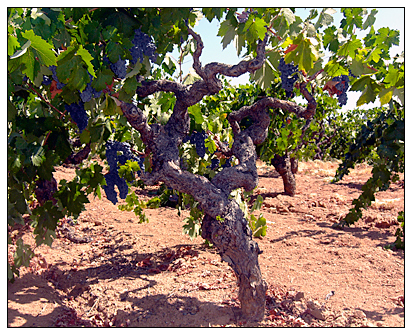 Source: Ray and Helen Zanini’s 40-year-old head-pruned Fiddletown vineyard. Blend: Zinfandel co-fermented with 2% Alicante Bouschet to deepen the wine’s color. 5% Barbera blended in to intensify fruitiness. French oak chips added to the wine while in older, neutral barrels. 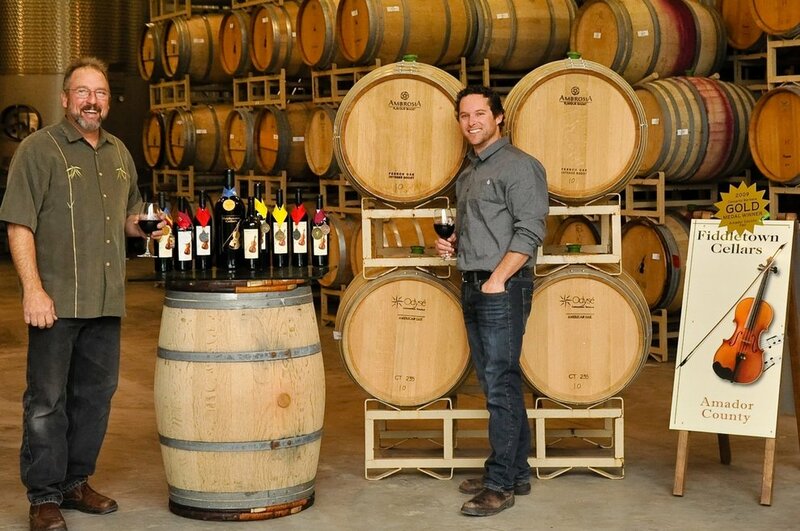 ABOUT THE PHOTO, ABOVE: Fiddletown Cellars founder Reno Farinelli, left, and winemaker Joe Shebl. Photo taken after this wine won one of two Gold awards in the Zinfandel category in the recent Fiddletown wines competition. Photo credit: Life’s Little Blessings Photography, Sacramento Bee, 12/22/11. The winery is located in Fiddletown, a picturesque and sleepy town, founded around 1849, during the Gold Rush. Fiddletown is one of California’s smallest AVA and is located within the larger Sierra Foothills AVA. At an elevation of 1800 feet, the vineyards have the longest growing season in Amador Country, allowing for maximum flavor concentration and exceptional balance year in and year out. Being Earth Friendly is easy to say, but it’s much harder to do. The actual winery is an energy efficient ICF (insulated concrete form) structure. Our water comes from our own artisan well, with UV sterilization to replace chemical additives. 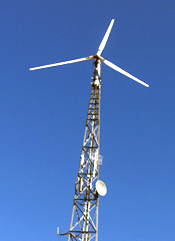 Year round power is provided by a 10KW PV solar system and the only private wind turbine, in Amador County. We use pulp shippers rather than polystyrene foam cores. In addition, we strive to do business with Green Friendly companies and use our fruit from organic farmers. We recycle everything; from cardboard to sending the fruit pressings back to the vineyard for organic compost. This entry was posted in Alicante Bouschet, Barbera, California, Zinfandel. Bookmark the permalink. One Response to HIGHLY RECOMMENDED: Fiddletown Cellars, 2009 Old Vine Zinfandel, Fiddletown, CA. 15.5% ABV. $18.99 from the vineyard. You can taste the Fiddletown Cellars wines at Amador 360 Winery Collective in Plymouth, CA (Amador County).